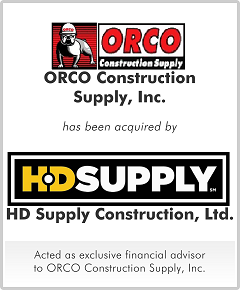 ORCO Construction Supply, Inc. ("ORCO") was the leading independent supplier of high quality construction materials to professional contractors in California, Arizona and Nevada. ORCO stressed the importance of its relationship with its suppliers and customers. Its employees had the most product knowledge in the industry. At its peak, ORCO generated revenue in excess of $300 million through its 18 locations. Two years later, new construction of residential housing was off 85% from the prior year, leading the entire building products distribution segment into a deep decline. ORCO's revenues halved and it was having difficulty identifying a new viable lender or buyer for the company. One of ORCO's Directors knew of M&A Capital's experience in construction products and distribution and requested assistance. M&A Capital advised the company in all aspects of value maximization, including raising debt capital, analyzing new business models with varying location counts, and assessing accretive combinations with competitors. ORCO's board of directors determined that a sale would maximize value. M&A Capital generated bids from 4 separate qualified strategic buyers, including HD Supply, which ultimately provided the highest value.